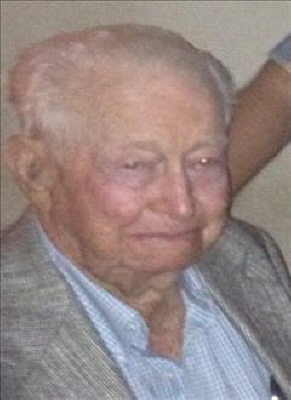 Celebrating the life of Harold D. Deever, Sr.
Obituary for Harold D. Deever, Sr.
Harold D. Deever, Sr., 91 year old Mooreland resident, died Monday, November 26, 2018 at the Mooreland Heritage Manor. Funeral services will be held at 10:00 a.m. Saturday, December 1, 2018 in the Billings Funeral Home Chapel in Woodward with Reverend Shannon Davis officiating. Burial will follow in the Mooreland Cemetery with the United States Navy providing military rites. Harold Duane Deever, Sr. was born on June 28, 1927 in Greenleaf, Kansas to Earl and Minnie Deever. He grew up on the family farm near Washington, Kansas. He was active at Washington High School and played baseball. After school, he joined the United States Navy at the very end of World War II. He went home to Washington, Kansas after his Navy service and met and married Edna May Hedding on February19, 1948. Edna and Harold lived and worked on the family farm. Their son Harold Jr. was born there. Harold Sr. then began working for Natural Gas Pipeline of America. His career took the family to Rochelle, Illinois and then on to several communities in Southern Oklahoma, before settling in Mooreland in 1961. As his son grew up, Harold Sr. was a very active supporter of Mooreland Boy Scouts and the FFA. He retired at 55 to enjoy his favorite hobby of fly fishing in Colorado. Harold was preceded in death by his parents, his wife Edna and one sister Bernice. He is survived by a son Harold Deever, Jr. and wife Tami of Maile Point, Hawaii; one granddaughter, Chelsea Sutton and husband Jonathan of Irvine, California; two great-grandchildren, Quinn and Lila May Sutton and one sister Barbara Weber and her husband Jim of Bellview, Nebraska; Harold also enjoyed the care and friendship of neighbors Geary and Donna Lewis and Dirk Dewald. To send flowers or a remembrance gift to the family of Harold D. Deever, Sr., please visit our Tribute Store. "Email Address" would like to share the life celebration of Harold D. Deever, Sr.. Click on the "link" to go to share a favorite memory or leave a condolence message for the family.